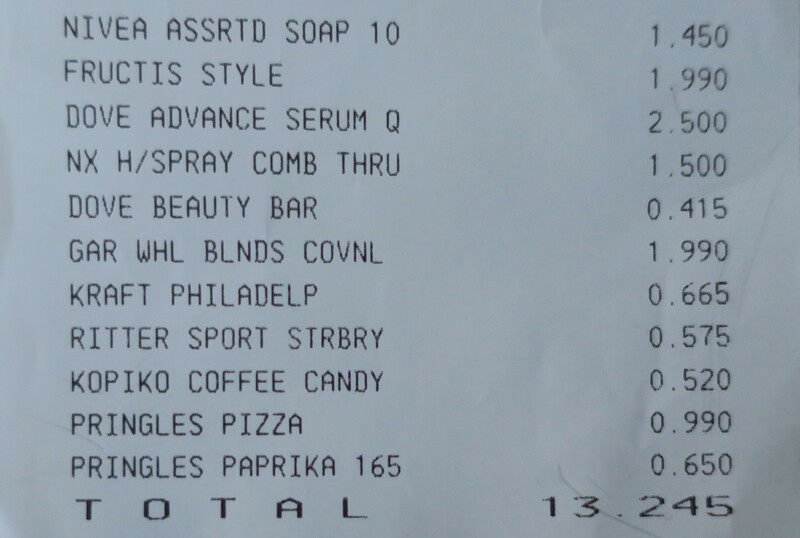 Also at Soug Sharq and during that same visit, no less, (it’s slowly dawning on me that I might have a problem lawl) I stopped at Sultan Center for soaps, snacks and some more Hair Care stuff (I wasn’t joking about my hair being a mess). Hair spray gives your style softness, body, bounce and shine. Nexxus Comb Thru Natural Hold Design and Finishing Mist contains Nexxusphere time-released technology that includes nutrients, antioxidants and UV protectors. I got suckered into purchasing this due to the name and princess-eque packaging. Unfortunately, using this stuff is effectively like tossing a lollipop in your hair. It clumped everything together (almost like glue) making it impossible to style, let alone comb through. I’ve really been enjoying my Garnier Fructis Curl Construct Mousse (reviewed here) but I wanted something to define my natural curls even more. I’m not quite sure but I think Dove Quench Absolute Supreme Crème Serum is the one that everyone raves about it (yes? no? maybe?) which is why I picked it up. As an added bonus, this stuff supposedly eliminates frizz, and for some reason I seem to be having a serious issue with frizz at the moment. Our first-ever hairspray with bamboo extract and anti-humidity protection for 24-hour, bounce-back hold and natural, healthy-looking movement – even in 90% humidity. 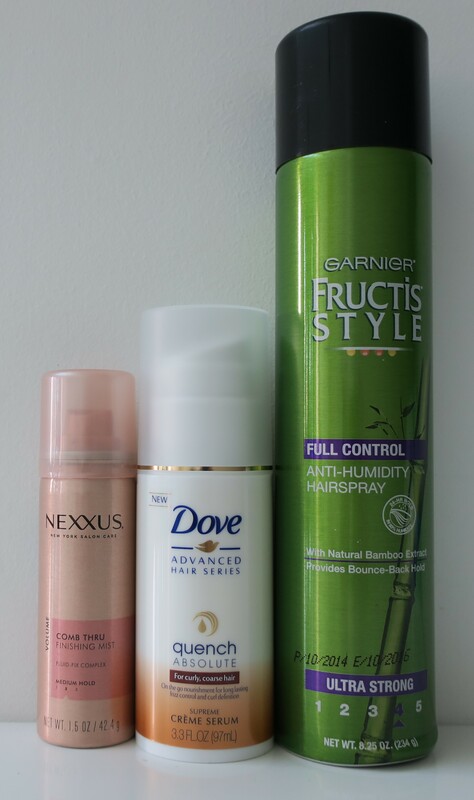 Garnier Fructis Style Full Control Hairspray is a versatile hairspray that gives you ultra strong hold over any style – even with moisture in the air – all day, every day. All day, erryday! Their words, not mine. With that being said, Garnier could come out with whatever they want, and I’d still run out and buy it (at least just one, to try) because I simply adore that brand. Sadly, upon closer inspection, this (and every other can of this) had expired, like, a year ago. You might think, whoah, that’s unprofessional but that’s just how things go in Kuwait. Anyhow, I went back a few days later (with the receipt) and exchanged it for some candy instead (I luv me some Haribo Worms!). Can you tell that my main gripe with my hair at the moment is frizz? Truth be told, I was immediately drawn to the cute, circular packaging in the cheerful blue shade (adorable!) and once I realized it was by Garnier I was sold (pretty much instantly). 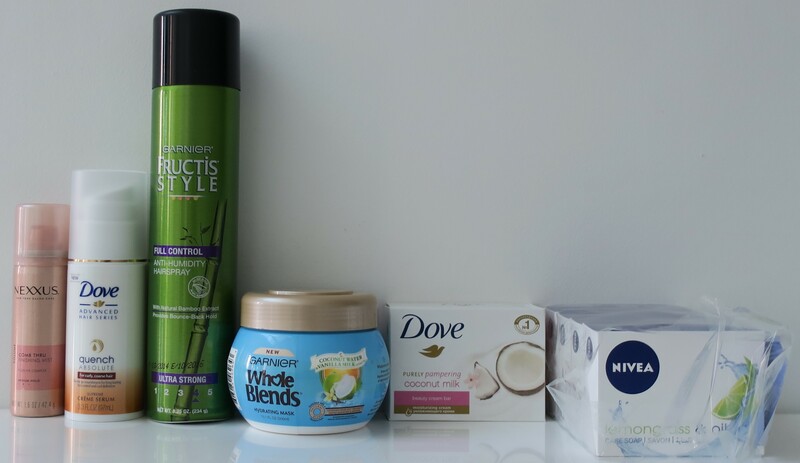 Generally, I love all things Garnier but this “Whole Blends” thing seemed intriguing, and my hair was being even more difficult recently, and I tend to enjoy Hair Masks, and this stuff came in a delightful Coconut Water & Vanilla Milk scent (which smells fantastic!) so I just had to get it. My women’s intuition told me to get a backup but I ignored it (typical LuLu). Less than a month later, when I ran out of this stuff, I went back to Sultan Center but it was nowhere to be found :( I hate it when they do that. I’m positive that this Garnier Whole Blends Hydrating Mask with Coconut Water & Vanilla Milk Extracts isn’t a limited edition item, so why bring only a few pieces, get us hooked, and then leave us hanging? So not cool. 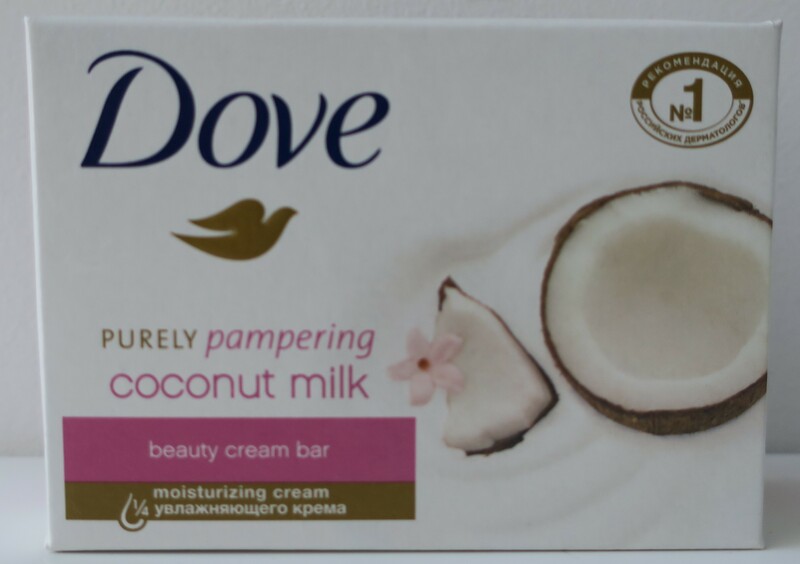 Dove Purely Pampering Coconut Milk Beauty Bar combines gentle cleansers with ¼ moisturizing cream and a comforting coconut milk with jasmine scent that leaves you in a state of peaceful tranquillity. When I spotted this Coconut Milk Soap, I decided to keep the Coconut thing going and get it too, just because I’d already picked up a product that had Coconut (Garnier Whole Blends Hydrating Mask with Coconut Water & Vanilla Milk Extracts) earlier. Unfortunately, soaps like this leave a “hydrating” film on the skin, and despite the fact that it’s hydrating, I just can’t stand anything that leaves any sort of residue on my skin. Even the scent came across as vile (at least for me) because I can’t stand the scent of Jasmine either. It was quite large for a bar of soap as well, and felt a bit strange, not quite gritty, but not as smooth as what I’m use to either. Overall, I did not enjoy using this up, at all, (they can’t all be winners, Dove) but that’s okay because the Nivea Lemongrass & Oil Soap more than makes up for it. 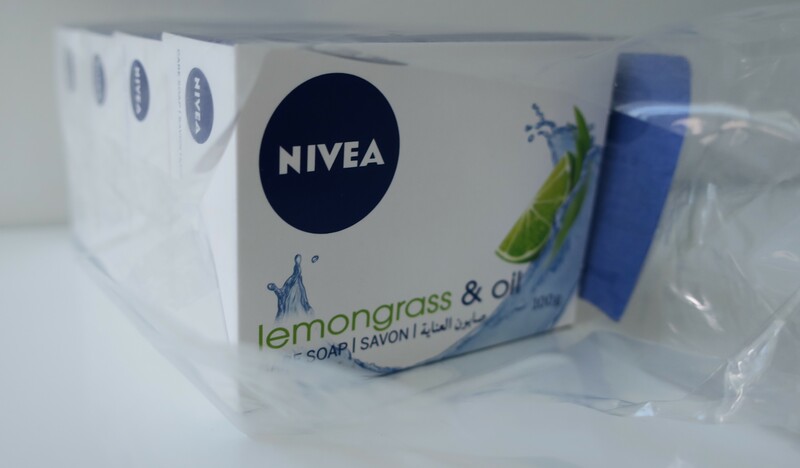 NIVEA Lemongrass & Oil Care Soap revitalizes, gently cleanses and cares for your skin. Together with the new Hydra IQ technology, pampering oils and the energizing scent of lemongrass, it leaves the skin moisturized for softer and smoother skin. Yeah, so I purchased just one bar of this stuff at Sultan Center (hauled here) and pretty much Fell. In. Love. As a matter of fact, everyone I know has subsequently fallen in love with this stuff as well! Get this if you enjoy uplifting lemon-y scents (it’s actually closer to Lime or Skittles but whatevs). People at home (dad, younger brother, etc…) always grab a bar or two for themselves, whenever I come home with a whole pack (10 pieces) of this stuff. My friends are always asking me about it, once they leave my guest bathroom. It’s not difficult to suss out why this is such a crowd-pleaser. The scent is sublime! Yeah TRESemmé is pretty bomb! I haven’t used as much Dove stuff though. Would you recommend anything in particular for damaged hair?